Easington Sports took another huge step towards the UHLSport Hellenic League title. 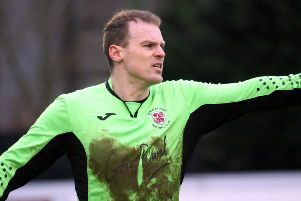 Ben Milner’s side beat Newent Town 2-0 in Saturday’s Division One West clash while title rivals Cheltenham Saracens and Thornbury Town dropped points in their 1-1 draw. Goals in each half from Owen James and Joe Eyre earned Sports three more points at Addison Road. Newent started the better of the two sides and had a couple of early chances. Pat Gibbs should have done better but allowed Joe White to save from point-blank range and then had a close range effort ruled out for offside after being set-up by Sanchez Grange. 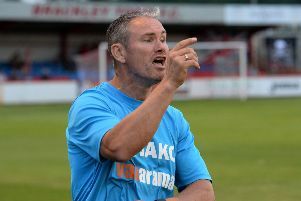 Alex Goode tipped over Charlie Hill’s header from Callum Convey’s corner before James broke the deadlock when he picked his spot from 30 yards and found the top corner of the net. After the restart Goode kept out another Hill header from Convey’s corner and Eyre shot over from the edge of the box. Sports needed the second goal and twice went close to getting it, James released Eyre who shot over before linking up with Joe Coleman who was denied by Goode from a right angle. But the crucial second goal finally arrived when Convey’s pass released Eyre who lobbed the advancing Goode who then did well to foil substitutes Andrew Stidder and George Combes in quick succession with two excellent saves.